Demanding the right to clean, affordable drinking water is far more than an organizing tool in an area with the highest concentration of poverty in the State of California, it is a matter of life and death. Tulare, in the San Joaquin Valley, is one of the most productive dairy and agricultural counties in the country. While publicly funded systems pipe crystalline Northern California river water to farms there, decades of intensive fertilizer and pesticide use and run-off from animal factories have so contaminated the groundwater that hundreds of thousands of residents are being poisoned by their tap water. Susana DeAnda is determined to change that. In pursuit of their dreams for their children, her family emigrated to California where she was born from Jalisco, Mexico. By the age of 11 she had lost each of her parents. Mourning her losses, DeAnda was determined to receive the education her parents had hoped for and she became the first in her extended family to go straight from high school to a university. On summer breaks, DeAnda travelled to Aguascalientes, Mexico, where she interned as a children’s environmental science teacher and she studied literature and polished her Spanish at the University of Queretaro. In 2004, DeAnda joined attorney Laurel Firestone to work as an organizer for the Rural Poverty Water Project at the Center on Race, Poverty and the Environment. Travelling to isolated low-income, unincorporated communities throughout the Central Valley, they saw horrific evidence of the health consequences of drinking water with high concentrations of nitrates, arsenic and other toxins. They gathered leaders together to address their common challenges which led to la Asociacion de Gente Unida por el Agua, a coalition of 17 communities and seven nonprofits. In 2006, without a penny for their start-up, DeAnda and Firestone spun off their project and launched the Community Water Center to focus exclusively on building grassroots capacity to act as a catalyst for the growing water justice movement. 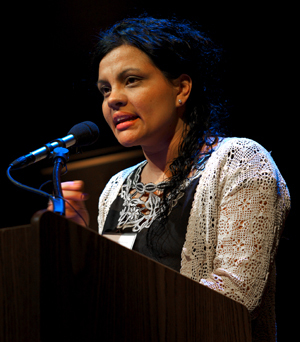 Armed with a comprehensive curriculum she’d created on the California water system, DeAnda distributed Spanish-language fact sheets detailing how the state’s investment in the infrastructure needs of agribusiness had long taken precedence over drinking water, knowingly putting residents’ health and safety at risk. Families who had buried too many stillborn infants and who drove long distances to purchase bottled water they could ill afford rather than drink black tap water that smelled like sewage, were galvanized into action. They raised their voices at public hearings, won seats on local water boards and secured legislation that directed $2-million to a pilot project for water quality and wastewater treatment for the Tulare Lake Basin. In partnership with her co-director, encouraged and energized by engaged community activists, DeAnda anticipates the day when every American will be able to drink a glass of tap water without fear of getting sick.